Hello and good afternoon! What a wonderful Wednesday it's turning out to be. 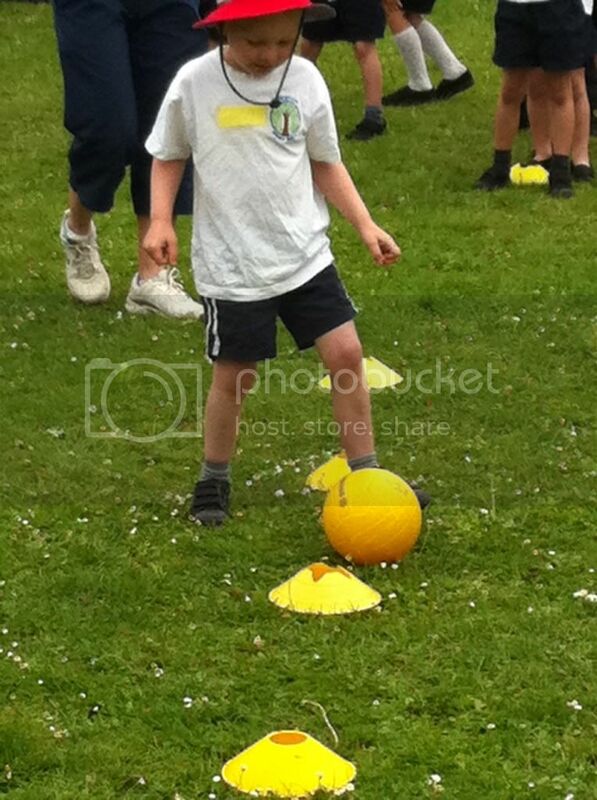 We all spent the morning at My Boy's first school sports day and our pep talks about taking part and having fun being the most important thing were completely unnecessary, as not only did he hold his own in the events, but his House (team - do you have 'houses' in other countries?) were the overall WINNERS!!!!!! And on to my WIPs - after finishing The Blanket in time for my Sunday Year of Projects update, it's been fairly relaxed on the crafting front. I've been compiling some patterns for my YoP list and ordering the necessary yarn so there's not much to see this week. Did you spot that scrappy little crochet flower in the picture? I bought the pattern for Queenie's Lula Crochet Scarf last night. 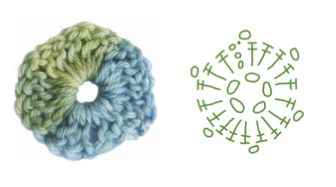 I haven't followed a crochet chart before but it looked so clear and easy to follow, with each step shown in a chart, picture and words, I really wanted to give it a try. The only vaguely suitable yarn I had was the leftover ball from the Spring Tulips shawl so I tried it out and it looks like the pattern will be easy to follow. I've ordered a Clover Soft Touch hook in the correct size (I find them much nicer to hold than the plain hook pictured) and I'm hoping both hook and yarn will be here in the next few days to get started for real - although I may make a few more of these little flowers and use them to decorate something for Little Miss in the meantime. So that's it! Not much to show for a whole lot of words - sorry :-/ As always on a Wednesday I'm linking up with Tami's Amis - you can find lots of other Works in Progress by following the links there. Love the little flower, it's so cute :) I think the extra row of knit stitches should be absolutely fine, like you say, it's black! Besides, you'll probably be the only person that ever knows it is there. Congrats on your first crochet chart experience! I still haven't tried one. wow, i'm impressed! i can't knit yet but i'm planning to learn before the year is up! thanks for the comment on my page. oh & i love, love, love your granny blanket!!! so beautiful! have a great rest of the week! i'm from texas & we don't call them 'houses' we just say teams. when i read your stuff i try to read them in a english accent (in my head) & i'm horrible at it. :) must be my texas twang in the way. 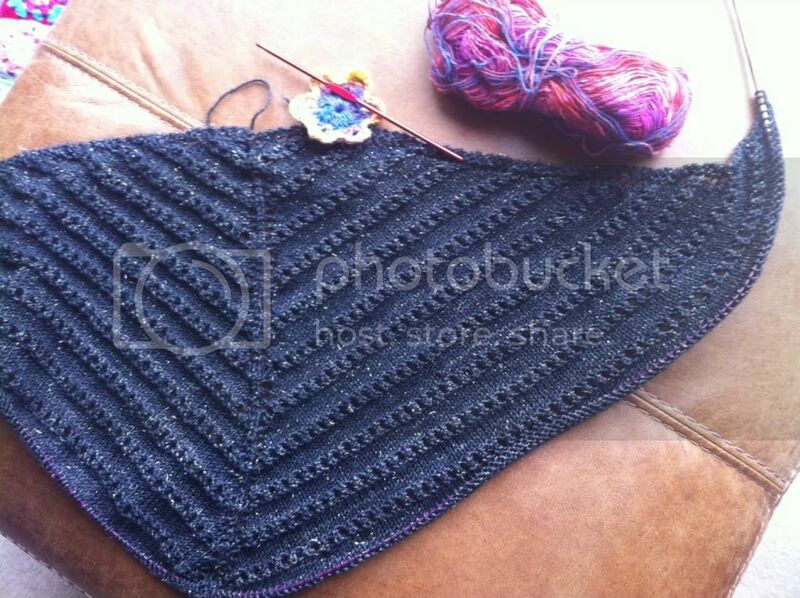 I like the shawl, hoping to get one going on the needles myself soon. I'd be similar, I'd find it very hard to ignore even one line of the wrong stitch! The blanket is adorable and the the shawl looks lovely! I make flowers from scraps whenever I can. I bought a book at Joanns that is nothing but flowers. I think I'm going to put the shawl on my YOP, and the flower is beautiful and definitely going to be worth while making a scarf from. It's like what we were talking about last night - that one extra row makes it special! You (and all those you have now told!) will be the only people that knows its there! I wrote a post earlier but it disappeared clearly! I loved last night - thank you so much! We most definitely need to do it again! That shawl is so pretty, I love the pattern. In Canada we had "houses" on sports day but they were just named for colors. How dull. I was also in either Green or Gold. A pleasant post to read on this wet and foggy day here in the city. Good to read about your two cents about the crochet hook. Knit night for me is mostly eating and talking, though I love love love it and count the days until we meet again. Luckily we meet every Monday night. :) The biggest part for me is getting their help for things, or just suggestions. The shawl looks great! I love it more every time I see it. Oh, and no, at least in America, we don't have school houses. For me, I didn't even know anything like it existed before Harry Potter! Lovely shawl, love that yarn with the stitch pattern. What a darling picture of your little one, he looks like he was having fun. Loving the shawl, such good texture. I've missed so many of your posts! I signed up for an e-mail subscription but maybe I accidentally deleted them, but thats OK because I just had a lovely catch-up on all of your goodness! Thank you for your lovely comment, it was hard to stop blogging regularly but now th pressure is off I'm more inclined to do it, funny how that works!